Instead of a cheese board...try a dessert board for pairing with wine! Dessert and wine = both divine. But what about dessert wine? Personally, I've never been a huge fan. Generally, the dessert wine and digestif part of the menu intimidate me, and the wines in particular are often a little (dare I say it) too sweet--to the point of being cloying. But when Jameson Fink, wine expert and official cute person extraordinaire (see photographic proof below), invited me to discover some dessert wines that just might change my point of view, I was open to the experience. You see, he just spent a spell at Finnriver Farm, where they make--among other things--fortified dessert wines. And I trust Jameson, because he's also a devotee of all things magical and sweet. And he has very passionate feelings about cookies (crispy on the edges, softer on the inside, but it's all about the contrast). Yup, he's a good egg. So, on Super Bowl Sunday, we met up--I brought a sack of baked goods, and he brought the booze: an assortment of Finnriver dessert wines (Black Currant, Pear, and Blueberry), and some sweetened sparkling wine and some prosecco. Sweet deal! And as for de-mystifying the dessert wine, my cupcake asked Jameson a question about the wines. totally not creepy at all, right? and after that, we popped some corks and (hic) got to work. First, we sampled each of the dessert wines on their own. The Blueberry wine was a sweet surprise: it was slightly tart, and the berry taste really rounded out the sweetness. It was a very pleasant beverage. The Black Currant wine was mellow and well-balanced, sweet but not cloying, and with a very fruit-filled finish. Once again, very pleasant, not overly sweet. The Pear wine was the sweetest of the lot--a little went a long way. This one felt like it needed something to cut through the sweetness. Then, we tried pairing some of the sweet wines with the sparkling wine and prosecco, sort of like we were inventing our own sweet aperitifs. 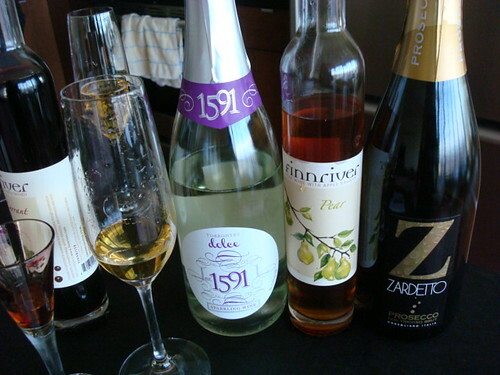 The pear in particular was, in my opinion, improved by the dry prosecco, which cut through the sweetness. But my favorite combo? The Black-currant wine with prosecco. Nice, very nice. 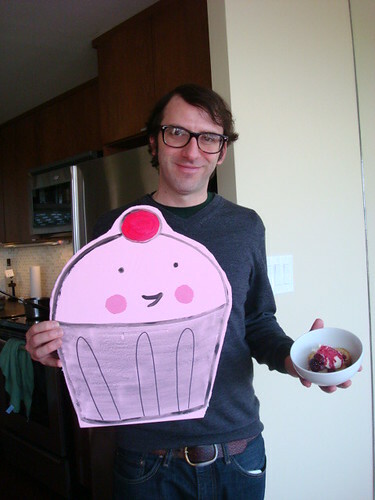 And finally, we decided how we'd like to incorporate it into a dessert. Well, I had brought quite a few options, but we decided that with the strong flavor of the wines, we wanted to let them shine. Like Jameson had said in the video interview with my cupcake, these wines work beautifully with simple desserts, so we decided to assemble some ice cream sundaes--our own "Super Bowl Sundaes"! After testing which combo of berries and wine tasted best (the winner: blackberries soaked in black currant wine with a spash of prosecco), we made some delicious treats. They are so easy--and SO good. Here's how you can do it at home. 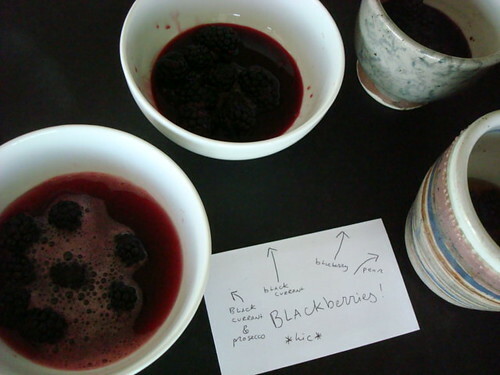 Allow the blackberries to soak for a while in a mixture of blackcurrant dessert wine and prosecco (at least 20-30 minutes), then simmer in a small saucepan until the juices begin to reduce. Remove from heat and let it cool for a few minutes (it will thicken further as it cools). Once it is warm but no longer hot, assemble your sundaes. 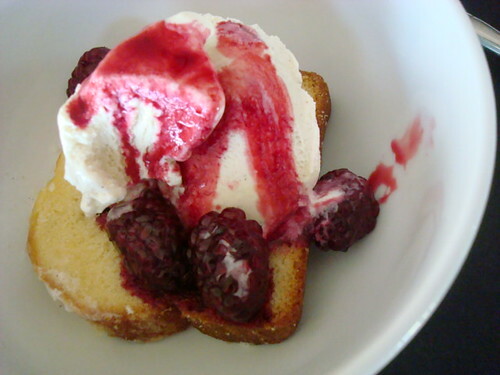 In two small bowls, place a slice of poundcake, a generous scoop of ice cream, and then spoon half of the berries and sauce on top of each. If desired, garnish with glazed/candied nuts. Consume immediately, and why not--enjoy it with some dessert wine or prosecco too.